Sign up to be Notified - Blogger I.Q. 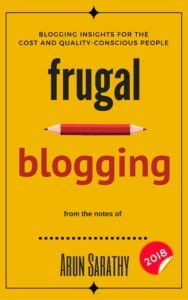 My book, Frugal Blogging: Blogging Insights for the Cost and Quality-Conscious People is all set to release on November 7, 2017 (Tuesday) on Amazon. Sign up below to get notified when it goes LIVE because you don’t want to miss out on downloading the book for FREE when it’s released, do you? The book will be available for FREE to download for a limited period of time.